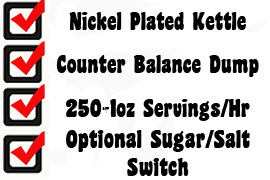 Features: 240 one ounce servings per hour. 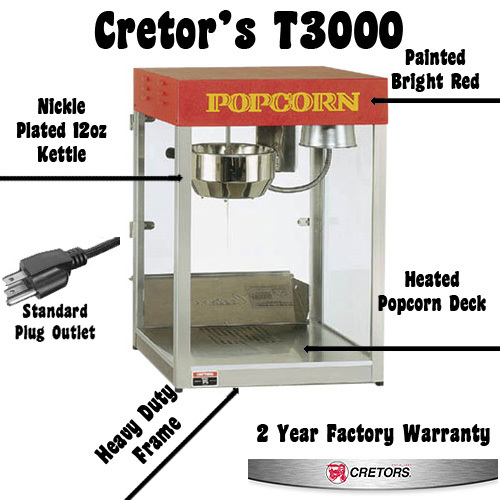 The T-3000 has a counter-balance dump system that makes dumping the kettle easy and efficient. It is designed for use with 12 oz. portion packs.Online purchases may inquire addtional cost depending on ship location. Cretors large popcorn machines go by truck. Please call for best freight rate. These Cretor's matching two wheeled wagons will compliment your new Cretor's popcorn machine. These are only for Cretor's. If you have a Paragon popcorn machines, these will not match your paint scheme. Be sure to choose the size that fits perfect for your machine.